Are fussy eaters born or made? I suspect it’s a bit of both really. Our biggest lad is an extremely fussy eater and if I am honest, I’m partly to blame. The middle lad is better and the littlest lad is best, so far! I have phases of worrying about the biggest lad’s eating habits and other times when I roll with it. Surely he’ll tire of his white food diet eventually. We’ve tried many things to improve the biggest lad’s fussy eating. We almost always eat dinner together as a family, we take him grocery shopping and let him choose foods, I cook with him, we’ve used sticker charts to reward tasting foods. I’m even seeing a nutritionist for advice. Despite my best efforts, nothing has changed. I’d consider myself a competent cook, even a bit of a foodie. Mr Wallace and I eat healthy, home cooked meals, almost all from scratch and very little from packets. I’ve well and truly mastered cooking purees for when the boys started solids. Where I’ve come unstuck is the move from purees to ‘family’ foods. It’s a murky area that I’ve not managed to successfully navigate. When I was invited to attend a class at the Tiny Bites Cooking School I jumped at the chance. I’ll take all the guidance I can get! I coincidentally met Kylie from Kidgredients while I was there, a lovely bonus! 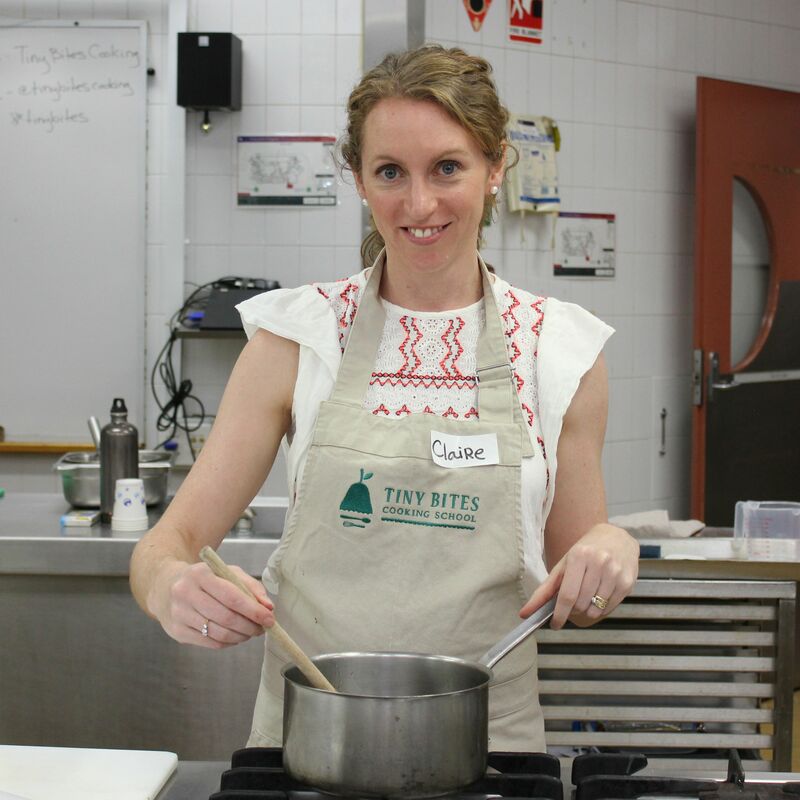 Tiny Bites Cooking School is a fabulous new cooking school. 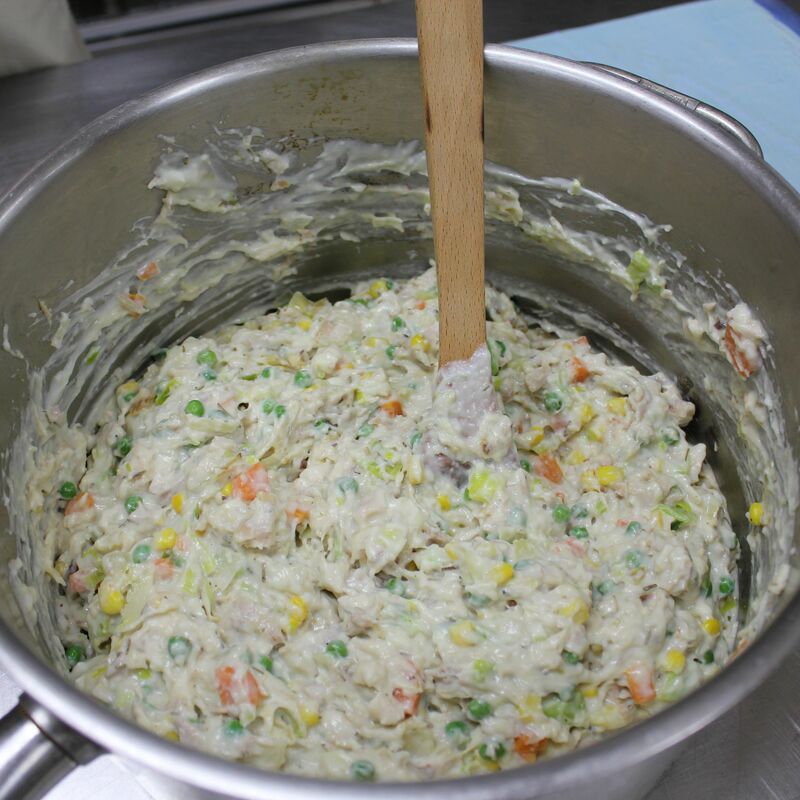 They offer hands-on classes for parents and careers, teaching essential cooking skills for babies starting solid food through to the preschool years. 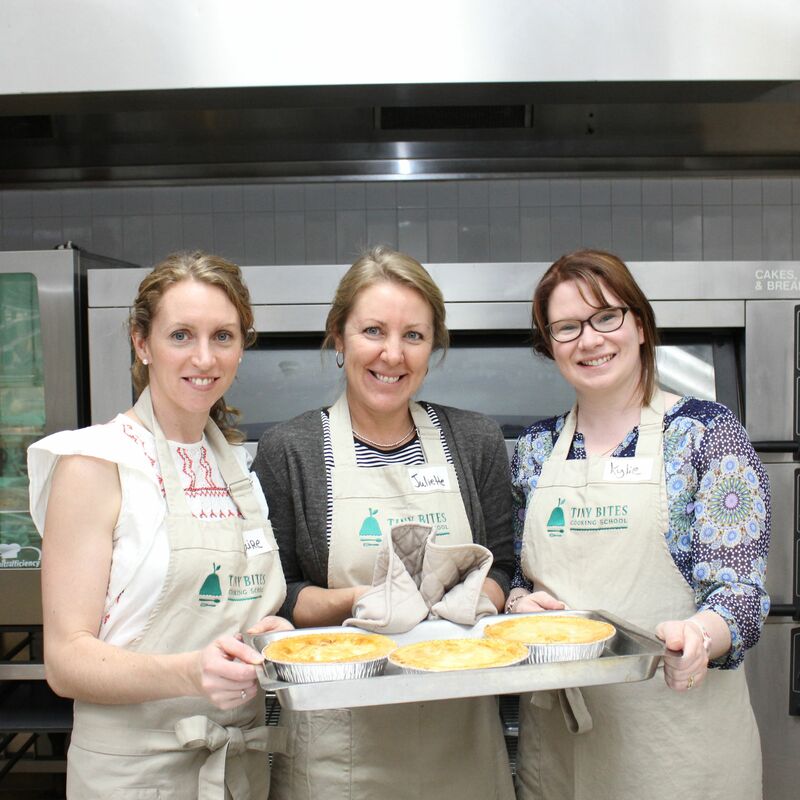 The classes have been developed by a professional chef and an accredited paediatric dietitian, who are also Mums. I went along to the three hour ‘No Fuss Meals’, aimed at that typically fussy age of 2-4 years old. Our lovely teacher, and the founder of Tiny Bites, Allison Murray set out the tasty menu for the day. It included lasagna, cheats chicken pie, meatballs, blueberry and polenta cake and muesli bars. Amazingly, you take home your own pies and lasagna, as well as some meatballs and a few pieces of cake. We also received the recipes so we can recreate the meals at home. The philosophy behind the menu is to put a healthy spin on classic family meals. Allison teaches the class in a really honest, friendly and open manner. She welcomes questions throughout the class and encourages discussion. There were a few ‘take home’ messages for me. One was that kids aged 2-4 are naturally fussy eaters, it’s them, not you! Allison encouraged us to consider nutrition over the period of a week rather than a single meal. Basically, don’t stress about one meal being rejected! Finally, and I’d heard this before but it was worth hearing again, it takes about 15 tries of a particular food before a child will acquire a taste for it. So try, try and try again (x15)! The challenge with the biggest lad is actually getting him to try a new food. He can barely tolerate something foreign (therefore poisonous) being on this plate. However, he did show an interest in what I had made and I managed to get him to have a nibble of a meatball. While it seems ridiculous, that was a huge achievement. I told the biggest lad what I learnt to cook and we’ve agreed that I’ll make the cheats chicken pie for us to eat. Even that is progress. Tiny steps and tiny bites with this kid! The No Fuss Meals class has however renewed my commitment to keep encouraging him to try new foods, offer healthy foods and to persist! There’s no magic solution for my biggest lad’s fussy eating habits, it’ll be a long road. This is a kid who can detect when I’ve tried to cook the carrots in the same water as his pasta and then refuses to eat the contaminated pasta. He can tell if I use a different butter on his sandwich. Nevertheless, my time at the Tiny Bites Cooking School has given me knowledge and motivation to perserve with the developing the biggest lad’s palate. Man it’s going to be slow. 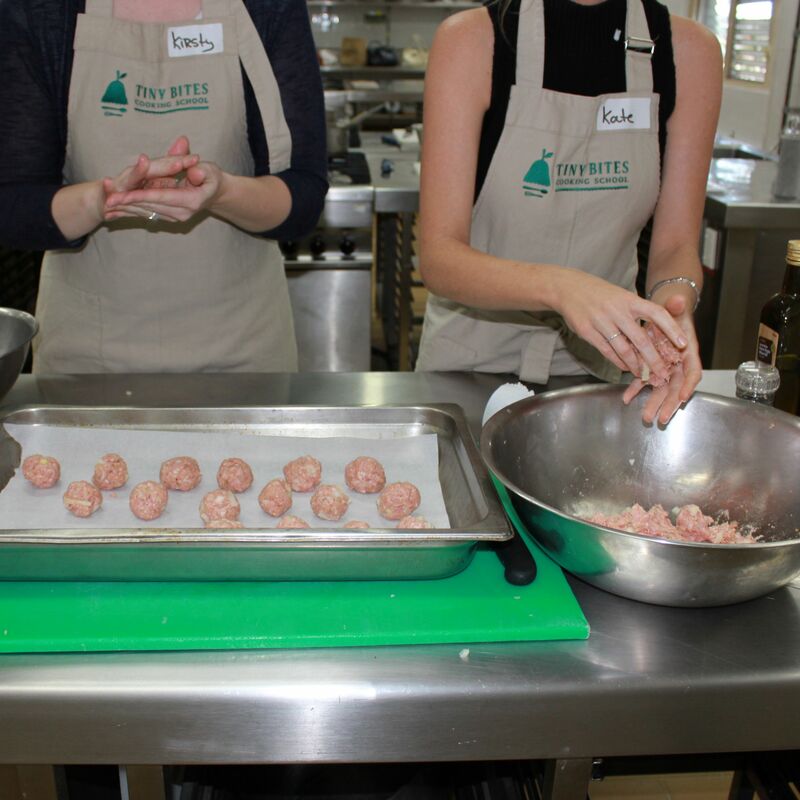 The Tiny Bites Cooking School run classes in Ultimo and Brookvale. There’s also after class support through 6 months membership to the Tiny Bites Cooking online community. If you are interested in attending a Tiny Bites class, visit them on Facebook or Instagram. Are there any fussy eaters at your place? I attended the Tiny Bites Cooking School as a guest. These are my own, honest opinions based on my experience of the No Fuss Meals class. Lise, my middle lad often REQUESTS broccoli! It is a great idea isn’t it Lauren! I’m sure if you were ever in Sydney, Allison would love to have you in a class.